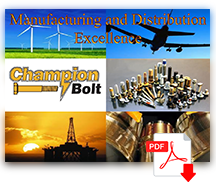 Customized Packaging - Champion Bolt, Inc.
We offer custom boxes, packaging and shipping labels to streamline the entire shipping and fulfillment process. Custom boxes and labels help streamline things on your end. Customer specific labels with all pertinent information. Drop ship to your customer with your logo on the package. the ship ticket is what’s in the box. items that are running low.